* We’d like to thank our friends over at Venngage, specifically Nadya Khoja, for once again adding such a valuable and entertaining perspective to our blog! Recently, I’ve been thinking–the time I spend online is perhaps only 50% productive. The remaining hours I’m either on Facebook, watching videos of cute animals on YouTube or doing a Buzzfeed quiz to try and figure out what food best matches my personality. It’s sushi, by the way. As a result, I’ve come to realize just how monotonous my life has become. When I was younger I used to read all the time, or go outside! Now my weekends roll around and I have to force myself not spend half an hour reading about how an Instagrammer Matches Makeup To Snacks (which is actually pretty cool, I encourage you to read it). My conclusion is that the many clickbait articles that exist now function as a drug. You can’t just stop reading them, or you might die. Rather than attempt to avoid the power of clickbait articles, however, I decided it might be best to understand them. That way, the next time I find myself trying to figure out what kind of grilled cheese I am, at least I can figure out exactly what elements about the quiz or article I find compelling, and use it against other people! So how exactly does one understand a clickbait title? What do you use to measure its clickbaitiness**? 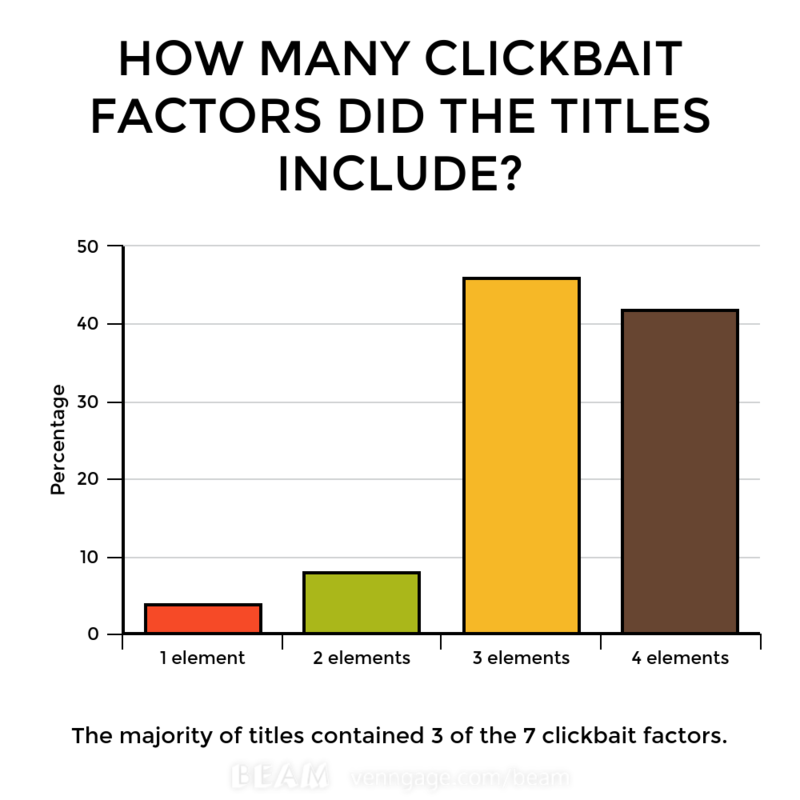 Well there are some tools that exist which aim to tell you just how clickbait a title is, but I found that they can be somewhat inaccurate and a bit too simple. I started my research by using CoSchedule’s headline analyzer to assess the top performing articles from the past three months that were featured on 24 high-traffic sites known for producing particularly clickbait titles, such as Buzzfeed, Upworthy and Cracked. Some of these sites had as high as a million shares for a specific article in under 3 months! Surely the title should score 100% on the title analyzer, right? Clearly this title analyzer did not accurately reflect what kinds of titles result in social shares. The means of measuring how shareable a title can be is just too subjective, and has a lot to do with current affairs or what is being covered in the news. I used Buzzsumo to collect the data for analyzing the various titles and to see the number of shares the most popular article from each site received. My goal in doing so was to discover exactly what it would take to boost blog traffic with a single headline. 1) Was the title a list? As might be assumed, a list-based article is something along the lines of 18 Photos That Won’t Make Sense To Sisterless Families, which is a common style for Buzzfeed articles and considered one of the most popular types of content on the internet. 2) Was there a mention of “You” or “I” or a personal story aspect to the title? In his book Contagious, Jonah Berger expresses the importance of using stories to engage people with your content. Why do you think case studies are so popular? Because if something can affect another person, it means there’s a chance it can affect you too! Titles that mention or hint at a personal story get clicks. 3) Was there an animal mention? 4) Did the topic receive recent media attention, or was it a news piece? As you probably could have guessed, trending topics in the media gain a lot of attention, so if your title mentions a recent event, you will likely see it receiving a lot of attention. This exact thing happened with a few of our blog posts at Venngage. When Star Wars: The Force Awakens was coming out, we did an infographic about the movie. When there was a lot of media coverage about the Syrian refugee crisis, we created some data visualizations to comment on the subject. Both were very popular! 5) Was there a pop-culture or food culture reference? Have you ever watched any of Buzzfeed’s Tasty videos? They’re addictive, right? Sometimes I watch my roommate spend hours on Tumblr just looking at pictures of food. This was her Facebook cover photo for over a month. Food is simply irresistible and so is pop-culture. As of late I can’t seem to get enough of 90s throwback references! The fact that Netflix decided to remake the show Full House as Fuller House should come as no surprise. Anything older than 10 or 15 years suddenly becomes iconic and novel, and thus evokes from people a strong desire to click. 6) Was there an unknown or new concept mentioned in the title? Introducing a new idea or suggesting an element of mystery makes it very difficult to resist clicking on a title. Here’s an example: between the following two titles, which are you more likely to click? You probably chose the second. Why? Because who wouldn’t want to know why the duck crossed the pond? The answer is unrevealed and as a result, you can’t help but wonder what it is. 7) Was there an element of shock or excitement? Shocking and exciting your reader is another powerful method to convince them to click. Let’s go back to the example with the duck crossing the pond. The first title example might actually work in this case if we rephrased the end result. So instead of the title being This duck just swam across this pond to get to the other side, it might be more shocking if the title was This duck just swam across this pond to save a man from a burning building! It’s shocking because it’s highly unlikely that a duck would be able to save a human from a burning building. If your title contains an element of shock to this extent, you will peak the reader’s curiosity. Do you ever find that after you study a subject in school for very long time you can’t help but analyze everything about it for the rest of your life? I’ll give you an example–I did my undergraduate degree in theatre and now every time I go to see a show I can’t help but speculate on the production choices, the blocking choices, the design choices and the transitions. The reason this happens is because once someone brings a fact to your attention, it’s almost impossible to unsee or unhear it. Like if someone points out to you that your girlfriend has a lazy eye, you may have never noticed it before, but once it’s pointed out to you, that’s all you see. 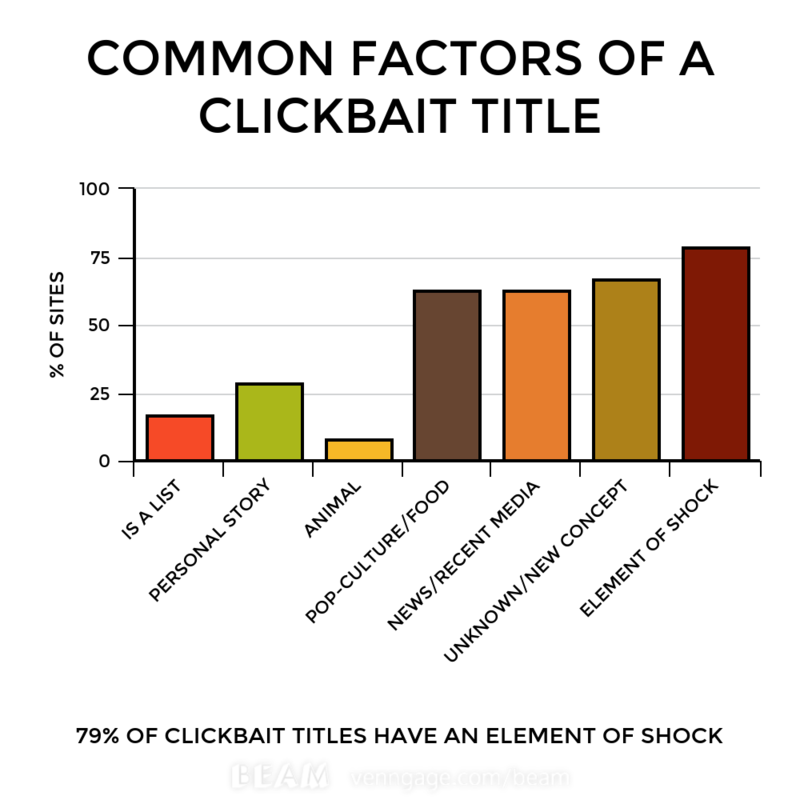 What I’m getting at is by reading this recipe about the factors that make for a perfect clickbait title, you will become better at spotting them on a more frequent basis. As a result, when it comes down to forming attractive headlines for your own content, you will face zero struggles. As a conclusion, I leave you with a challenge. Everytime you come across a new article, whether it’s one on your own blog or one that someone shares with you, analyze it and track whether it contains any of the factors listed above. As you continue to produce new content, aim to reach that target of hitting three of the seven factors. Hopefully you’ll notice a massive jump in social shares and become a millionaire overnight (well, the first part, at least)! **Clickbaitiness: Defines to what degree an article is considered clickbait on a scale of 1 to 10. This does not include articles which are not deemed clickbait at all. Lastly, this is a word I made up, but feel free to reference it. Nadya Khoja is a Visual Content and Digital Marketing Specialist. She is the DIrector of Marketing at Venngage. Nadya has a B.A. with Specialized Honours in Devised Theatre and a Master’s Degree in Digital Media with a focus on Audience Engagement and Immersive Experiences. She also recently launched a new blog, Chez Lisgar, which details her experiences cooking gourmet meals alongside her roommate and inviting random Toronto residents to their apartment for a shared meal.